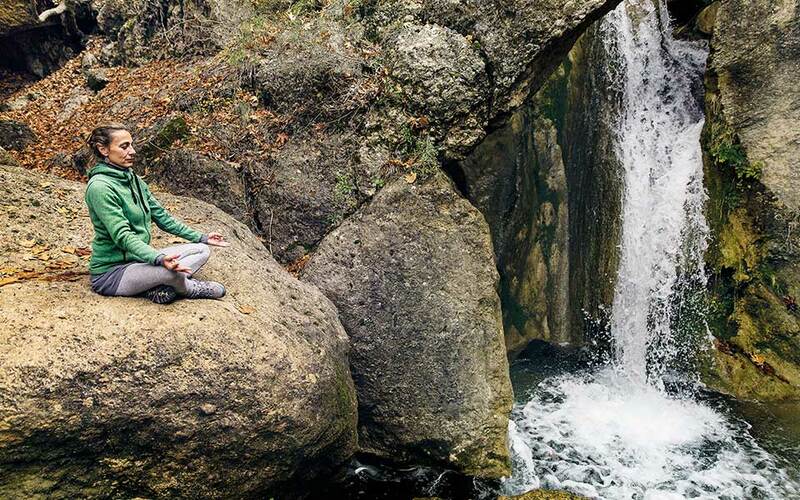 Apostolia Papadamaki, founder of The Happiness Retreat, leads outdoor group meditation and yoga classes in beautiful places around the country. Find inner peace and build core strength in a pristine setting at one of Greece’s many health retreats. The day starts with meditation or yoga, before you sit down for a healthy Mediterranean breakfast complete with local fruits, nuts and vegetables. Later, you’ll hike through a forest, swim in the sea, or step into an icy waterfall plunge pool. 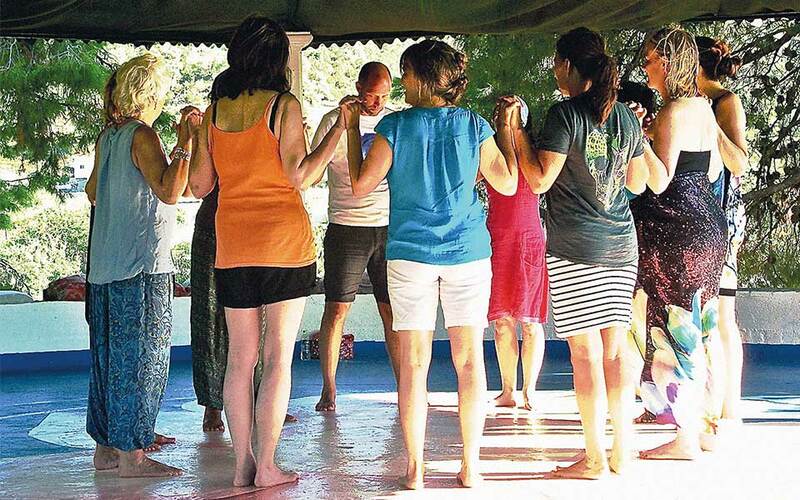 Visiting a health retreat in Greece is a treat for mind, body, and spirit. The approach is decidedly holistic, drawing on the wisdom of ancient Greeks who understood the importance of achieving harmony between body and spirit (yoga is based on the same concept). But its status as the birthplace of the holistic approach isn’t the only reason to choose a health retreat in Greece. Its natural wealth is just as important, and there are very few places in the world which offer such varied landscapes in such a small area. 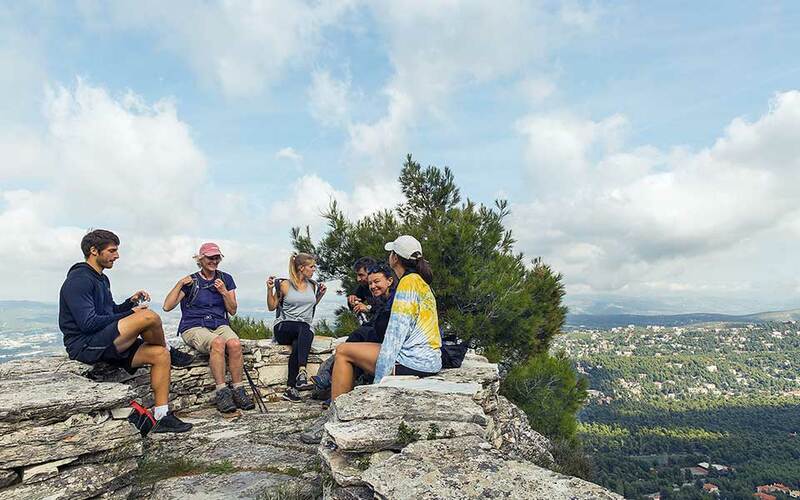 Fully aware of this comparative advantage, and wishing to help participants reconnect with nature, retreat organizers choose locations where it is at its most beneficent. Most leaders like to give lessons outdoors. Mountain yoga helps oxygenate the body and is said to stimulate energy flows; sunset meditation brings inner peace; and sea activities are thought to have therapeutic benefits. Even the food is chosen with care from what nature provides, which means everything is seasonal (many retreats are vegetarian or even vegan). There’s a wide choice of retreats. Some offer high-intensity fitness training or water sports, while others make time for sightseeing. You can join a retreat at a luxurious villa an hour’s drive from Athens, in a remote mountain village or on a cruise ship that stops at all the must-visit Cycladic islands. At the eco-cultural center Re-Green, visitors are surrounded by nature. 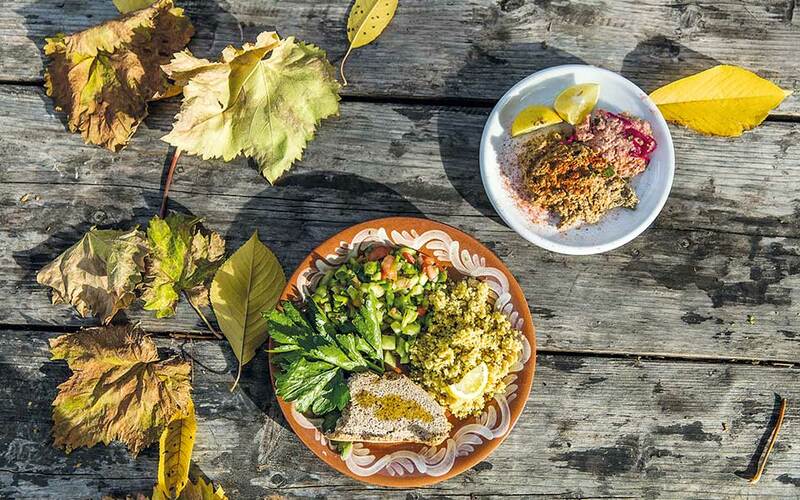 Delicious vegetarian meals are cooked with seasonal ingredients at Re-Green. Having studied movement in fields ranging from dance and yoga to scuba diving, Apostolia Papadamaki founded The Happiness Retreat, through which she teaches holistic health techniques at various beautiful locations. The Spring Celebration Ritual Retreat at the eco-culture center Re-Green, surrounded by mountains and waterfalls in the village of Seliana in the Peloponnese, is a popular choice. Aiming to help you better understand your body and control your breathing, the program combines yoga with detoxing, movement and breathing exercises, impulse dance, and outdoor excursions. Retreats on the islands feature a “water spirit contact dance” in the sea, and sunrise meditation on the beach, while the Dreaming Wide Awake Retreat includes exercises at archeological sites. On their private island between the mainland and Evia, sisters Lisa and Claire Christie have been organizing yoga retreats since 2012. Between April and October, there’s a new retreat every week, and they’re all different. The maximum number of participants at each retreat is 10. The island was once a luxury hotel resort popular with jet-setters. Today, the sisters have transformed it into a sustainable haven for those seeking privacy and pristine beaches. The former helipad is now a yoga shala, the food served is vegetarian, the water is supplied by a rainwater collector and the power by solar panels. 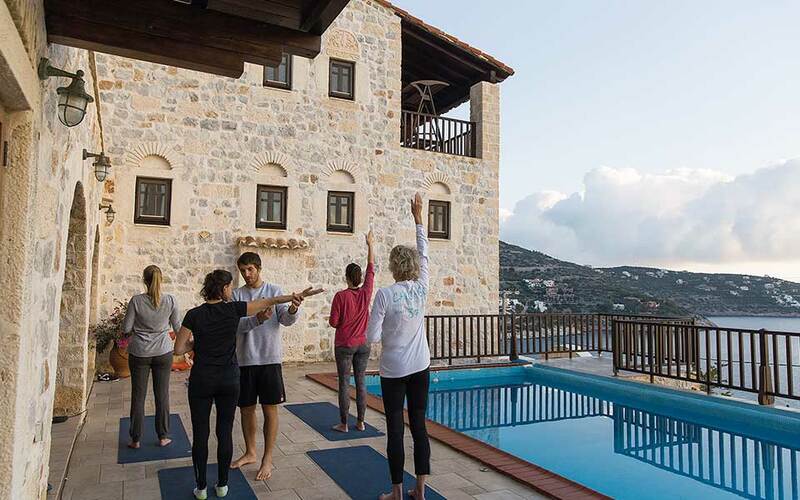 While most health retreats cater to small groups, yoga teacher Fotini Bitrou arranges retreats for as many as 45 attendees, making them particularly suited to large groups and families. Her annual six-day retreat on Ikaria is a popular choice. Here, sessions take place at The Egg, a large outdoor workshop space by the sea. Ikaria is celebrated for the longevity of its inhabitants, something many attribute to their traditional diet, so it’s no surprise that local food plays an important part in the retreat experience. Fotini also organizes retreats on her native island of Aegina; at the eco-resort Montanema in the mountains near Lake Plastira; and on cruise ships sailing the Aegean Sea. Waking up right, with the Morning Mobility class at Nefeli Nine. Hiking on Mount Penteli with the Nefeli Nine team. 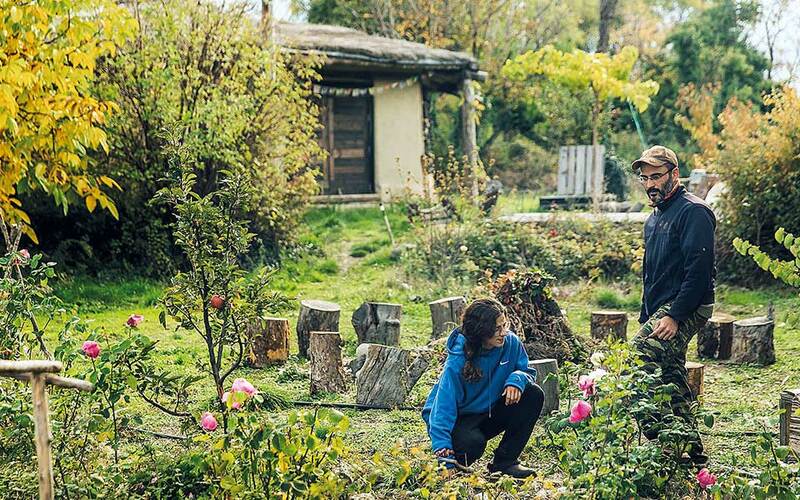 You don’t have to travel to a remote village or an island; at Nefeli Nine, roughly a one-hour drive from central Athens, Stephanie Contomichalos and Emilio Devoti organize week-long retreats that combine yoga, workouts and hiking. Here, in the beautiful area of Dikastika, you’ll stay in a luxurious stone-built villa complete with a pool and wonderful sea views. The days begin with a light mobility session before breakfast, followed by hikes through the wooded seaside landscape. Although adjusted to personal ability, the workouts can be fairly intense, but you’ll be royally rewarded with massages and spa therapies, and with great home-cooked food as well. 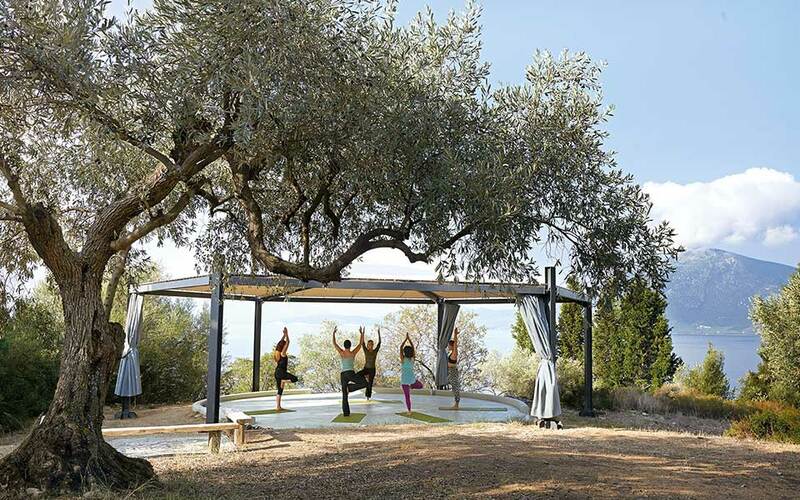 At this health center on Skyros island, you can customize your retreat by picking from a wide variety of activities such as windsurfing, reflexology, abseiling, yoga, massage, music, dance, performing comedy and tai chi. Founder Yannis Andricopoulos says he was inspired by the ancient Greeks and their holistic beliefs. Wellness seekers can choose between two locations on the island: the villa and huts at Atsitsa Bay or the facility on the outskirts of the main town. At professional yoga instructor Panagiota Ntozi’s health retreats on the island of Zakynthos, most classes are held outdoors, and there’s something for everyone. The Aerial Yoga Retreat, where participants engage in “anti-gravity yoga,” and the SUP Yoga Retreat, featuring paddleboard exercises, are firm favorites. Another interesting option is the Detoxifying Yoga Retreat, which combines stretching and breathing exercises with yoga and late-night cardio walks, while the Reiki Mindfulness Meditation and Yoga Retreat focuses on self-healing. The Brazilian Jiu Jitsu training camp offers personal training.